Elvis Today: Are you laughing tonight? I've always liked the way Elvis laughs. The first time I heard him do it must have been in the early eighties when the laughing version of "Are You Lonesome Tonight" was played frequently on the radio. In Europe it was released as a single, taken from the Elvis Aron Presley box set, and went on to become a pretty big hit. On the above mentioned box set, there is another laughing version, that has in its own way become a classic, at least among the fans. I am, of course, referring to the infamous "Datin'" from Paradise, Hawaiian Style that has Elvis cracking up a number of times on numerous takes of the song. It's highly entertaining and I always smile when I listen to Elvis struggling with the silly lyrics and completely loosening it. Another soundtrack song that has Elvis breaking up is "Beach Shack" from the movie Spinout. Thanks to FTD and its classic album series we can hear the first three takes, and right from the start it's clear that Elvis finds the lyrics he's reading from the lead sheet highly amusing. Giggles become an enormous laughter as he ad libs "What you think I am" right before he and the Jordanaires are about to sing the line "dum-di-dum-di-dum." Trying to pull himself together he exclaims, "It's got to be the silly hour," before loosening it again on the following take. I guess humor was the weapon with which to survive those soundtrack sessions in the mid 60's. It's great fun listening to and my favourite laughing version with Elvis. It wasn't just during studio hours that Elvis got the giggles. As you all know he often laughed on stage both between and during songs. "I'll Remember You" from FTD's Takin' Tahoe Tonight! featuring the 3 AM show he did on May 13, 1973, no doubt qualifies as a laughing version. The reason for this is Elvis having fun changing the lyrics to fit the early hour of the show: "Long after this, long morning is through... I'll be horny, ..lonely, oh so lonely." He also, for some reason, cracks up right at the end of the song, after which he laughingly announces, "Well, that's about enough!" Another live laughing version that comes to mind is "Love Me Tender" from Murfreesboro recorded on May 6, 1975, and included on the FTD release Dixieland Rocks. As I've written about that one before I wont go into any details, except to say that it's really funny. The final song I come to think of the rehearsal version of "Memories" from July 24, 1970, only available on bootleg. It's really hilarious and has Elvis changing the lyrics, making peculiar noises and almost laughing his head off. You have to listen to it to fully understand what I'm talking about. So there you have it. Six laughing versions that show the funny side of Elvis. Of course there are more of them out here. Can you help me out? Great post! 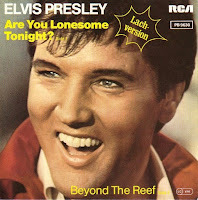 Seems like almost every other version of "Are You Lonesome Tonight" featured ad-libs and/or laughing. I've often thought about doing a post just on variations of that one song alone. The one from Elvis Aron Presley is definitely the best though. I always thought he made up the "Do you gaze at your bald head?" thing on the spot that night in '69, but I remember a few years ago hearing it on one of the '68 Comeback rehearsals as well. Binder or someone told him afterwards, "Elvis, we can't use that." Elvis did tend to re-use his little jokes, though, so I guess it's not that surprising. Two that come to mind are: "Promised Land," "Only the Strong Survive."